With the Mets playing Puerto Rico at home, their split squad came to Dodgertown today with only one regular starter and the Dodgers took advantage of New York’s young prospects with a 16-2 victory. 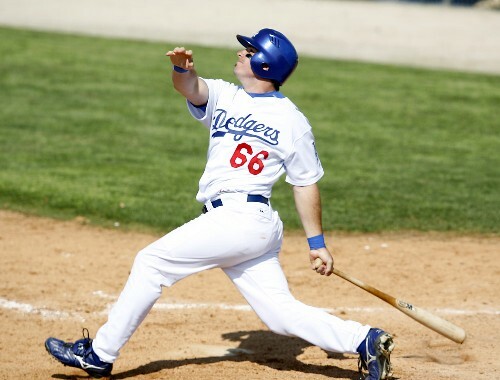 Andy LaRoche (pictured) had six RBI in one inning (yes, you read that right) and the Dodgers hit five homers after failing to go deep at all during the first three games of the spring. Derek Lowe pitched three perfect innings and Odalis Perez followed with three strong innings of one-hit ball (a bunt single). For those who missed their Sunday morning reading, Bill Plaschke wrote a great article today about Kenny Lofton in today’s L.A. Times, while Carlos Alvarado wrote a feature about Rafael Furcal in La Opinion for our Spanish-speaking blog readers. As for me, it’s back to Los Angeles tomorrow for two weeks, where I’ll be working to get everything in working order at Dodger Stadium (the PR Department, that is). Mark Langill, who has been posting periodically from L.A. will be out here in Vero Beach with daily updates from Dodgertown. I’ll check in with an occasional word from Chavez Ravine. And for those who were wondering, no, Mark Langill is of no relation to Eric Langill, the non-roster catcher here with the Dodgers. Mark pronounces his last name lan-jill and Eric is lane-gill. Now you can all sleep easy tonight, having that important piece of information. hey what a great game today! roche sure looked great. Oh hey by the way, is there any chance that we can see some updated stadium renovation pictures at least one more time before opening day? thanks.